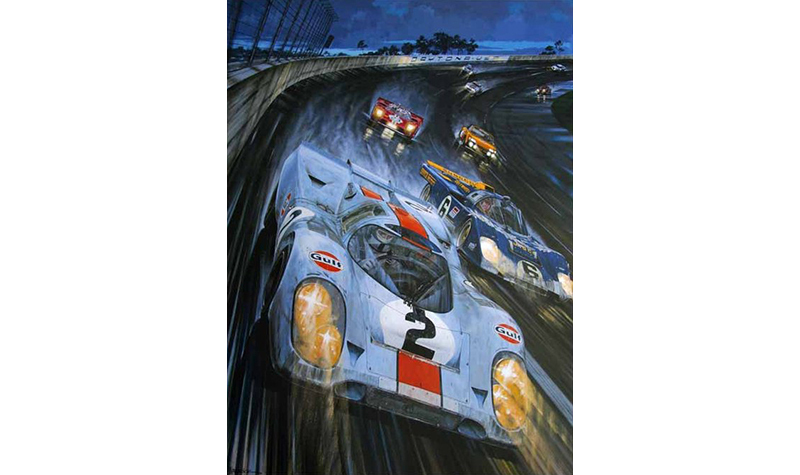 If you’ve attended the 12 Hours of Sebring, you have seen the motorsport art of Roger Warrick. 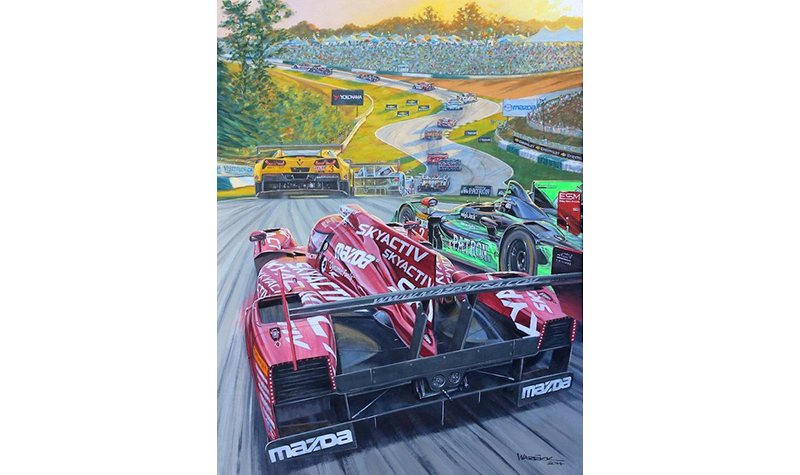 He’s been creating their event posters for several years, as well as for Road Atlanta. 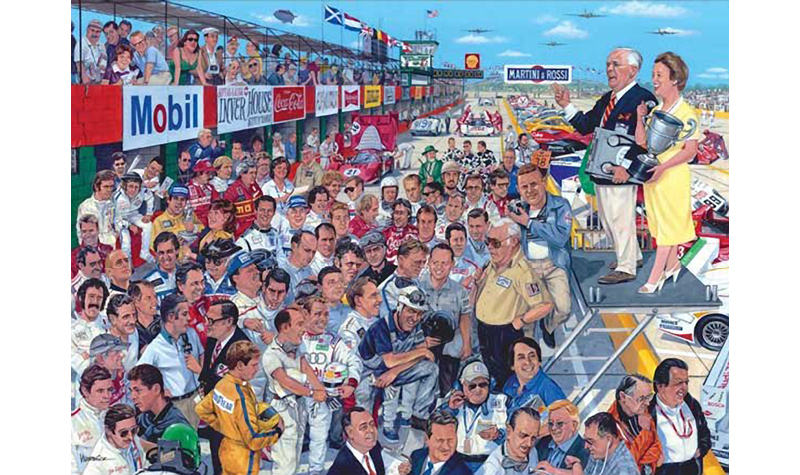 Mr. Warrick has his serious side and humorous side, unlike most motorsport artists. 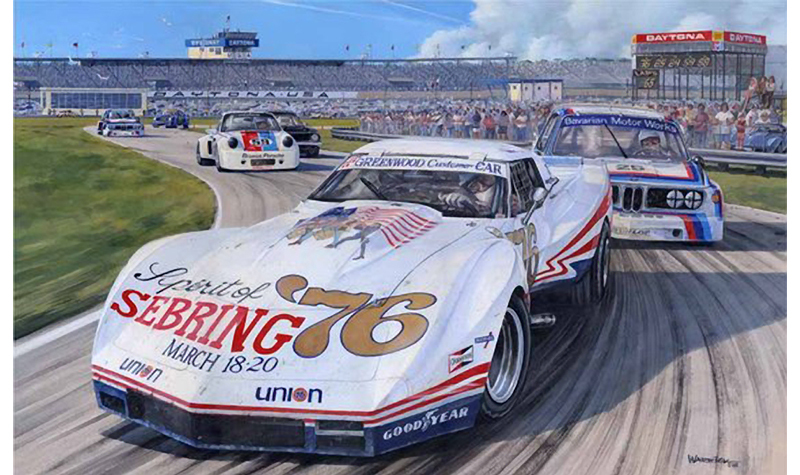 He’s comfortable creating a realistic portrayal of race cars on track (above), caricatures of famous race cars (left) or composite scenes of race drivers from various tracks (right). That’s quite a talent! While we will concentrate on the realistic side of Mr. Warrick, you would do well to check out his wide range of talents (links below). 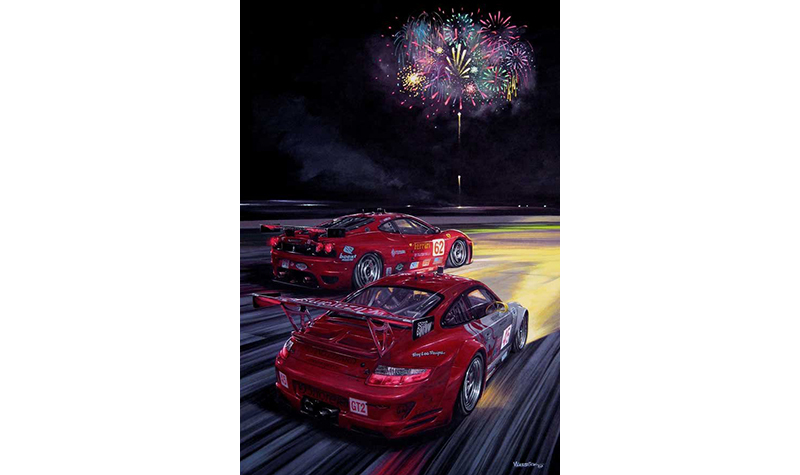 It would be easy to decorate your car space for not much outlay as his art is generally reasonably priced. 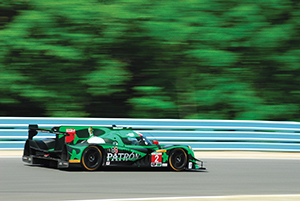 Many of us love the IMSA series as it brings the spirit of LeMans to America. Warrick embraces both and it is clear that he loves both worlds. 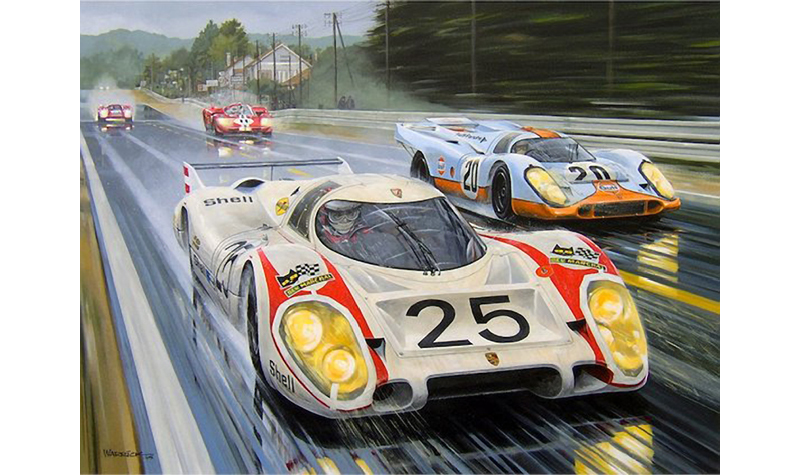 His scenes from Daytona, Road Atlanta and LeMans are terrific. 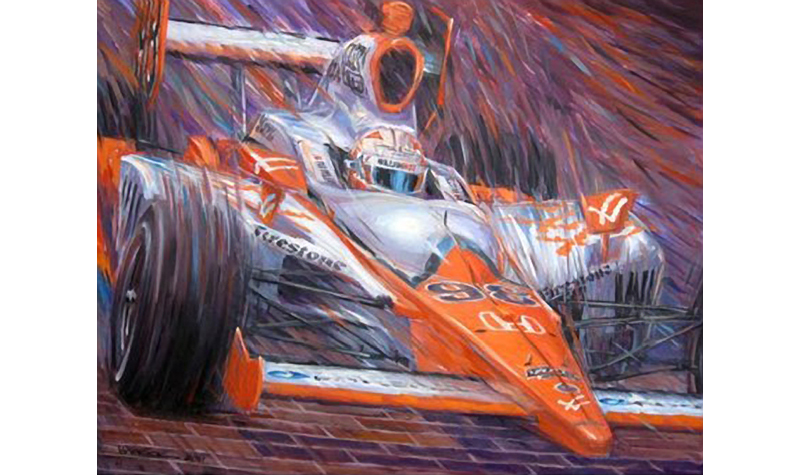 I am particularly enamored of his depiction of speed. This is somewhat hard to do on a motionless canvas. 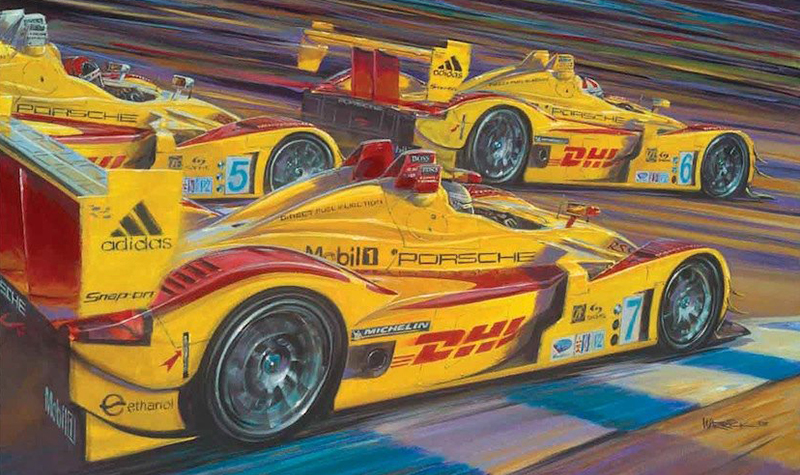 Few motorsport artists attempt this feat. 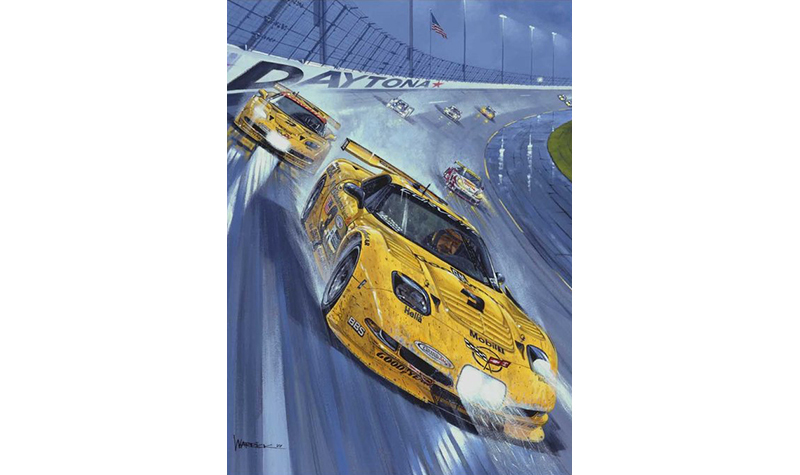 Mr. Warrick is successful while portraying Porsches on the Mulsanne straight or the banks of Daytona. He’s also found a niche in flying race cars. 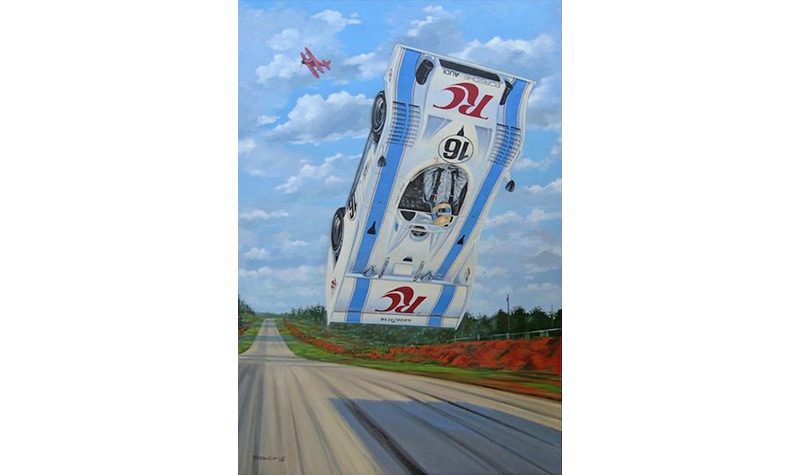 Before Don Panoz finally took out the crest on the back straight of Road Atlanta, the track was famous for lifting race cars airborne with ease. 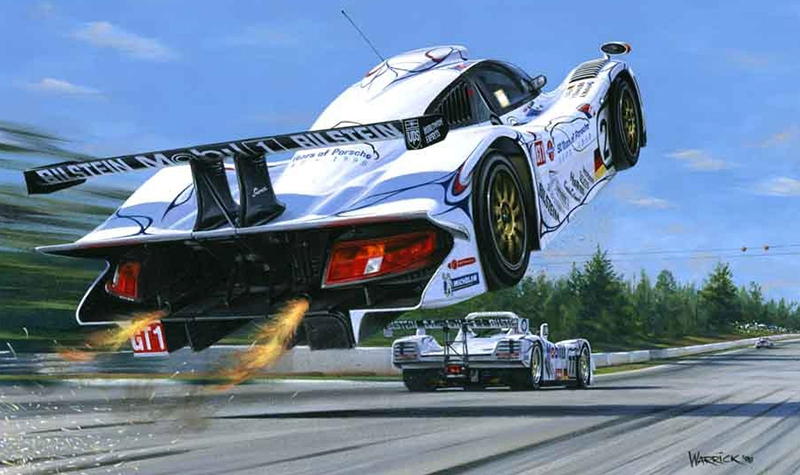 Catching air over that crest caught out Mark Donohue in his Porsche 917/10, George Follmer’s 917/10 the next year and the Porsche 911 GT1 at the first Petite LeMans in 1998, lifting them up and over. 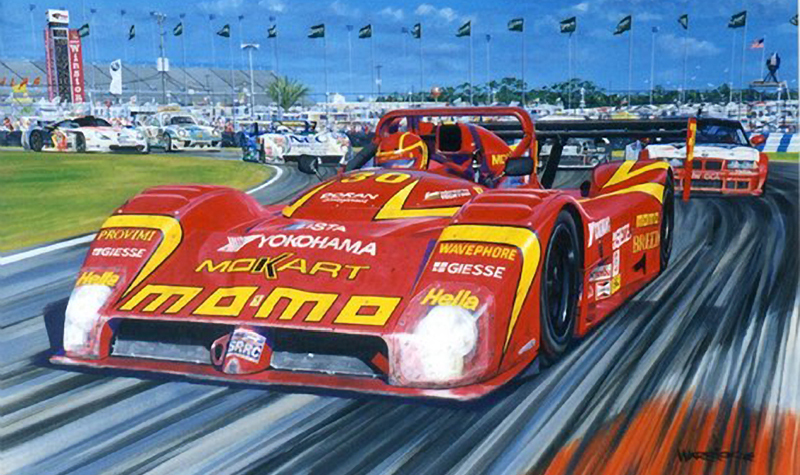 That flying adventure cost Donohue what would have been an overwhelming defeat of Team McLaren in the CanAm series when his car came crashing down and breaking his leg. 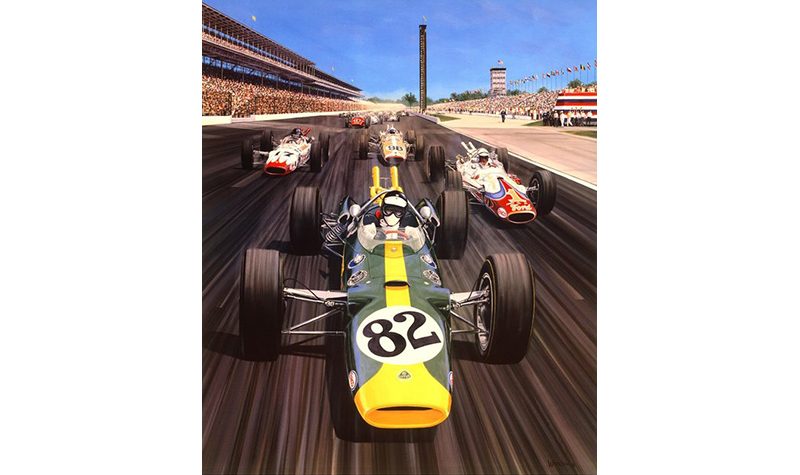 His replacement at Team Penske was George Follmer who handily won the 1971 series and did his own flying the next year. 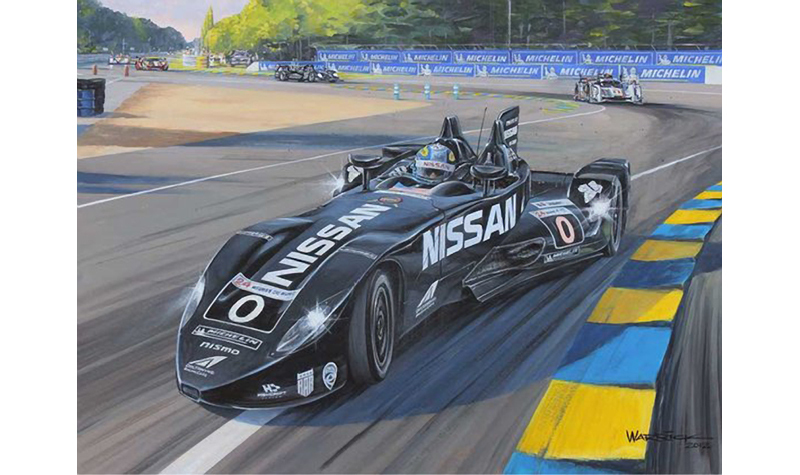 Warrick has also portrayed the legendary and horrifying flying antics of the works Mercedes GTP cars on the Mulsanne Straight of LeMans. 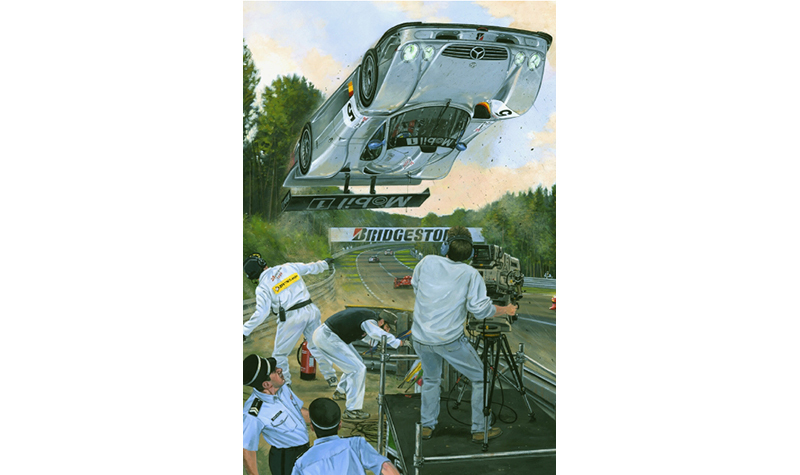 His image of the upside down Benz flying over a cameraman and track marshalls ducking for their lives would give anyone pause to consider the dangers inherent in motorsport.